On Wednesday, October 18th, the GCA sponsored another in its “Speaker Series” that brings together decision makers and thought leaders from disciplines that are of importance to our industry. Richard Kauffmann, Chairman of the Governor’s Energy and Finance and Chair of the NYSERDA Board, Kenneth Daly, President of National Grid New York and Stuart Nachmias, V.P. Energy Policy & Regulatory Affairs at Con Ed, joined GCA Executive Director, Denise Richardson for a lively discussion of the energy issues and challenges that face the State over the next few years as power generation sources diversify with the closure of Indian Point and as demand increases across the board. 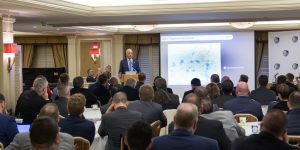 The nearly 100 attendees included GCA members who wrestle with major utility relocation and upgrades, got an insiders perspective on what may lie ahead in an industry that literally powers our regional economy.